Environment Memo | Environmental News and Analysis Environment Memo » Nuclear Event Scale: How High Is Up? Nuclear Event Scale: How High Is Up? 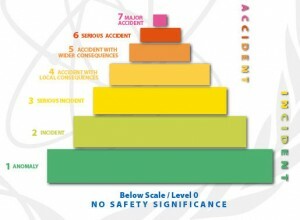 IAEA's Nuclear Incident Scale. 7 is at the highest. This graphical display takes the cake. It doesn’t get any higher than 7, it seems. Severity is logarithmic… so a 7 is 100 times more severe than a 5, ostensibly in the quantity of radiation emitted. (Which, as I’ve been pointing out, is only part of the story inasmuch as the fate and transport of the radionuclides really is what must be learned.) There’s a user’s manual for this scale, but I’m afraid to look at it. But I’ll try to find time to see what can be gleaned from it.